KUCHING: The Sarawak Health Department has issued 1,622 warning notices to eateries that have failed to comply with the smoking ban. As of Day 18, a total of 5,876 premises had been checked out of 8,090 registered eateries. From left: Deputy Mayor Hilmi Othman, Dr Billy Sujang, Dr Jamilah and MBKS Mayor Datuk James Chan. Its director Dr Jamilah Hashim said in a press statement that warning notices were issued to 1,396 eateries and 178 smokers. She explained that the owners of the eateries committed the offence under Regulation 12(1)(a) and the other 48 notices under Regulation 12(1)(b). 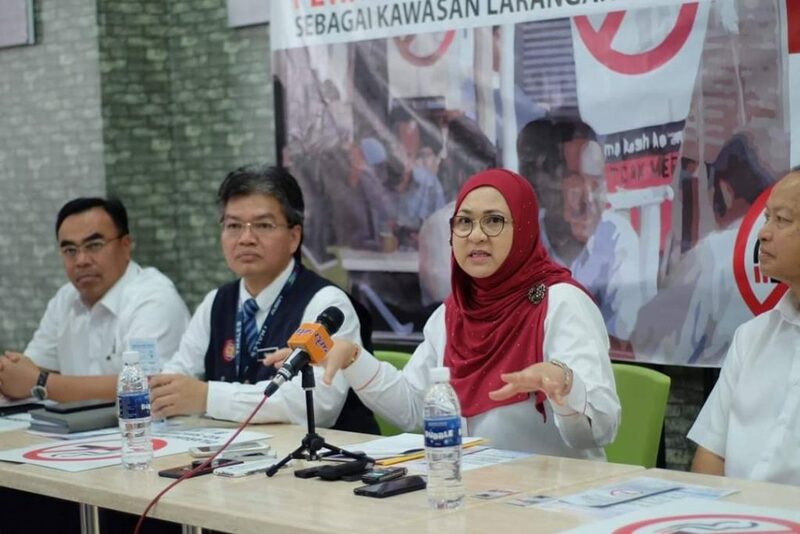 “While the other 178 smokers were warned for committing offence under Regulation 11(1)(d) of the Control of Tobacco Product Regulations, amended in 2018,” she said. Under the Control of Tobacco Product (Amendment) Regulations 2018, offenders could be slapped with a RM250 compound and if they fail to pay up, they could be charged in court where they are liable to a maximum fine of RM10,000 or two years’ jail. Premises owners could also be compounded for RM250 if they failed to put up “No Smoking” signs. If they fail to pay the compound, they could be charged in court and are liable to a maximum fine of RM3,000 or six months’ jail. The Health Ministry has implemented the smoking ban at nine types of public places, including eateries, food trucks, ships and trains, with those wishing to light up required to move at least three metres away from the premises. According to the statement, Kuching recorded the highest numbers of smokers committing the offence under Regulation 11(1)(d), with 47 notices, followed by Miri (41), Mukah (23), Sarikei (18), Bintulu (18), Samarahan (11), Serian (six), Kapit (five), Limbang (four), Sri Aman (three), Sibu (two) and Betong (0). “Meanwhile, among 1,396 notices, 342 eatery proprietors in Miri received warning notices for failure to display the ‘No Smoking’ sign, as stipulated by the government. This is followed by Sibu (214), Bintulu (190), Kuching (132), Mukah (114), Sarikei (113), Samarahan (95), Limbang (94), Serian (41), Betong (40), Kapit (13) and Sri Aman (eight). “The remaining 48 warning notices were mostly issued by the department’s division in Bintulu with 19 notices, followed by Kuching (12), Samarahan (six), Limbang (six), Miri (three) and both Betong and Sarikei, each recorded one notice,” she explained. She hoped that the public would reject the habit of smoking in public, and that more would quit smoking. Smoking ban: 1,622 eateries slapped with warning notices 0 out of 5 based on 0 ratings. 0 user reviews.